Is the grief caused by terrorism more intense than the regular kind? 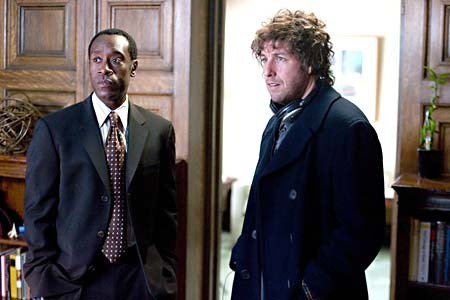 Yes, to judge by Reign Over Me (2007), starring Don Cheadle as Alan, a successful Manhattan dentist who helps his former college roommate, Charlie (Adam Sandler), recover from the trauma of losing his wife and three daughters in the inferno of 9/11. The critics panned this film for lacking a clear direction, but that's because it turns a predictable formula into something unpredictable. First of all, Reign Over Me contains no overwrought flashbacks to 9/11. Indeed, the only direct reference to that day is Charlie's painful recollection when finally induced to talk about his loss. Second, the film has a wide streak of the juvenile humor we've come to expect from Sandler and writer-director, Mike Binder (whose credits include the raunchy HBO series The Mind of the Married Man). The humor comes from Charlie's way of expressing his grief -- which is to regress to acting like a young teenager. Instead of dealing with his pain, he tools around the city on a motorized scooter, listens to rock music on his headphones, and plays kill-the-monster video games on a giant TV screen. Not only that, but he has been like this for several years when Alan runs into him, and it is clear that one reason why Alan decides to help is because spending time with Charlie allows him to regress, too. But the result is something more than another comedy about the prolonged adolescence of the American male, because the immaturity of these characters is thrown into relief by the dark backdrop -- and when they finally do grow up, it comes as a relief not a letdown. This page contains a single entry by Martha Bayles published on December 5, 2009 7:54 PM. Gobble was the previous entry in this blog. Under the Tree is the next entry in this blog.